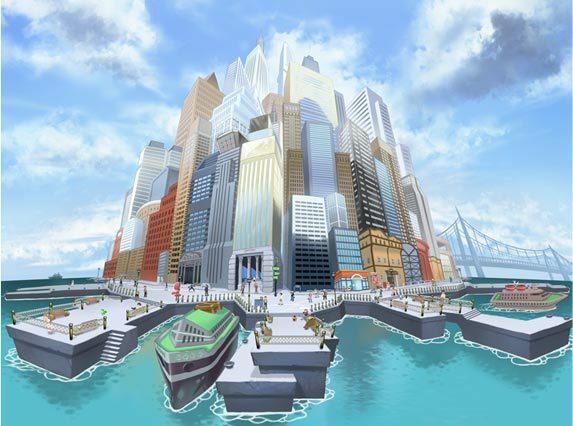 I’ve got to admit, while crossing Skyarrow Bridge was surely supposed to be a “cool” moment showing off what the Pokémon team had managed to achieve in terms of graphics, it came off as incredibly cheesy. First of all, 2D sprites look positively terrible moving along anything but a fixed plane, so all the dramatic camera angles looked really bad. Second of all, the graphics aren’t so impressive to warrant this kind of approach anyway. Better to stick to good ol’ classic graphics. Sure, having the pseudo-3D models for buildings and such worked fine in Gen IV, but this new step just doesn’t do it for me. The same problem could be applied to Castelia City itself. While I love the idea of the city in theory, the execution seems to miss the mark. The attempts at incorporating depth perception in the alleyways and side streets look forced and fake, the whole “rounded edge” feel, rather than making things seem more real, actually totally turned me off. I’ve been kind of getting this so-so impression about most of the cities so far in terms of design, which is pretty disappointing if you ask me. Unfortunately, I don’t have access to a stable Internet connection that’s compatible with the Nintendo DS’s wi-fi settings, otherwise I could have used a Liberty Pass to go nab myself a Victini. Looks like it’ll have to wait until my spring break in a couple of weeks. In the meantime, however, I not surprisingly got dragged into a conflict against Team Plasma, which led me to one of their secret bases in the city center, nearby the Pokémon Gym. Here I was expecting some kind of dungeon exploration similar to the Rocket Bases in Gen I, but yet again I was destined to be disappointed. Instead, I just got a cutscene where Team Plasma explained for the third or fourth time that their goals are to liberate all Pokémon. Bo-ring. 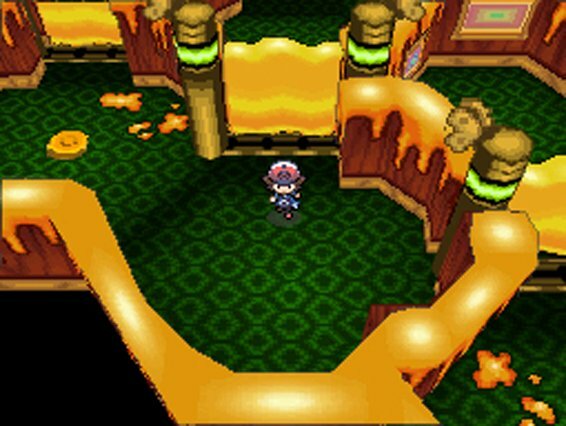 Castelia Gym was… well, the word “weird” comes to mind. I know it’s a Bug-type Gym, but the whole beehive aesthetic was totally unexpected. Of course, the Gym Leader does happen to be an artist, so perhaps that explains it. 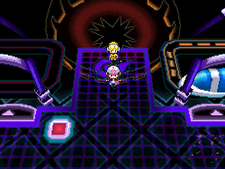 I was a bit surprised by how difficult the battle was – although now that I think about it, the Bug-type Gyms in previous games have all been somewhat challenging as well. Luckily my Pignite and Blitzle both had powerful Fire-type moves that helped pave the way to victory and the Insect Badge. From there I was forced to trek across Route 4’s desert. I heard rumors of ancient ruins somewhere in the sands, but I didn’t get a chance to find them. I did, however, find Nimbasa City, the desert jewel. It had a glitzy Las Vegas sort of feel with its amusement parks and neon lights and musical performance hall. Wish they could have played it up a bit more, but I can definitely visualize what they were going for. Not long after arriving I encountered N yet again, and he revealed his true identity as the King of Team Plasma. He invited me to join them in their quest to liberate Pokémon, but when I refused he challenged me to a battle. This time he was much tougher than the last two times I faced him, but I managed to pull through with some help from Roggenrola. I found it really difficult to make it through the Nimbasa Gym. It seemed like every Emolga I encountered set my team back several steps. Frequent trips back to the Pokémon Center ensued. Luckily, I managed to make it through to the Gym Leader, Elesa, and in the end it was actually my weakest Pokémon at the time, Pansage, who finished off her team and earned me the Bolt Badge. I started for Route 5, where I met the Unova Champion, Alder, who tested Cheren and me with a Pokémon battle against two youngsters in order to teach Cheren that not everybody enjoys Pokémon for the same reasons. While I was there, I took the time to challenge the rest of the traveling performers who had stopped in the area. With some help from Elesa, we lowered the drawbridge to the next city, where I’ll be going after I rest a while. Overall this game feels much more difficult than previous gens, but not in every game aspect. Battles are tougher, but exploring the overworld is streamlined and simplistic far beyond anything we’ve seen before. I’ll have to see how the game comes together as a complete package before I can really judge. After all, I’m still in the first half of the main story, and there’s sure to be some content to unlock once I defeat the Champion as well.